Sounds impossible? Well by now, dear reader, you should be ready for the unexpected. In today’s blog I shall reverse the natural order of things, turn the arrow of entropy back to front and disprove the second law of thermodynamics. 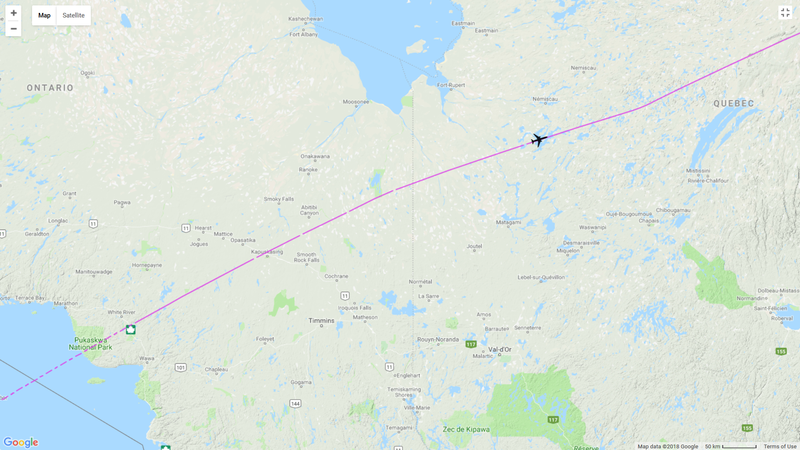 I am going to show you two graphs from the same flight and demonstrate a broken aircraft which healed itself, over the frozen heartland of Canada. I’m going to tell you about a particular flight. Unsurprisingly the aircraft landed. In this case in London where the approach took it briefly east of the Greenwich meridian, so the longitude trace started over the west of England (hence negative), became positive for a moment then landed west of Greenwich. Nerds may decide if this was Heathrow, Gatwick or Stanstead. It’s entirely irrelevant. The aircraft took off from an airport in the west of America. The aircraft flew eastward, corresponding to increasing longitude values. You can quickly see how often the signal changes to 0deg and back again. The pattern is not regular, and clearly erroneous. Looking at the same signal across the whole flight shows that the signal got progressively better until, about a third of the way through the flight, it worked correctly. In the graph below I have added two different types of signal, Airspeed and Engine 1 N1, to show that the problem was a recording problem not a signal source problem. Out of curiosity, we can find out where this happened if we plot the ground track. The problem was severe over Lake Superior, and finally healed itself as the aircraft passed the southern tip of Hudson Bay. I am not a believer in the Bermuda Triangle, and I certainly doubt the power of Canadian snow to solve avionics problems. When I was working in the hangar, this was the type of problem that we hated trying to fix. In this case, as with all the best intermittent faults, the aircraft does not have the problem at landing, and trying to track the source of a non-existent problem could take days. First you had to try to reproduce the problem, which most often you could not. Second, if you created a similar defect, you could never be certain that it was the same defect; there was a risk you had caused something else to go wrong. Finally, if you made a change, could you be sure it would fix the original problem? I have every sympathy with the line engineers faced with this kind of problem. The more complex the aircraft we make, the more common these types of defect become. What on earth has this got to do with helicopter rotor dynamics? (I hear you ask). Years ago a survey of naval helicopter NP vibrations (that is, blade passing vibration at the frequency of the passing of N rotor blades at P, the rotor turning frequency) was carried out. The survey examined all the maintenance actions taken and the results of those maintenance steps. The final conclusion was that maintenance activity that most often led to a reduction in NP vibration was to do nothing! Sometimes aircraft do heal themselves.